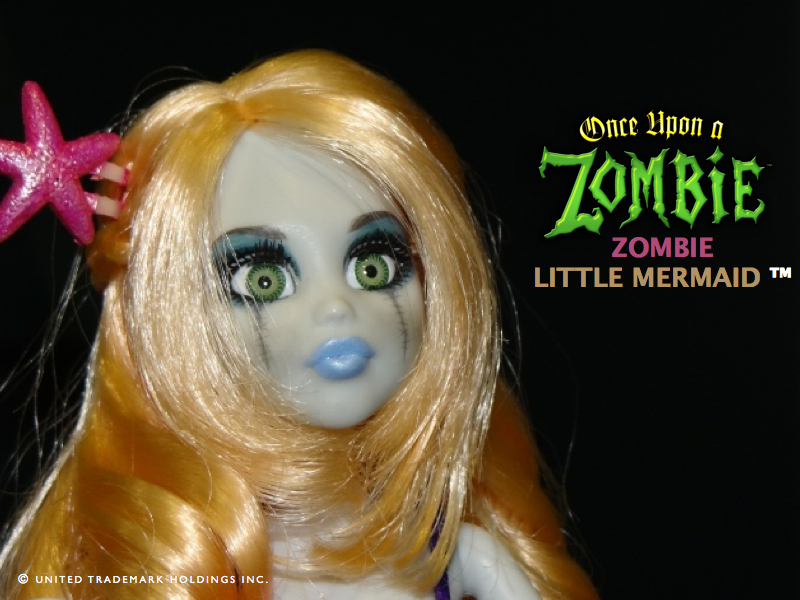 I love zombies and goth styled dolls so needless to say I fell in love with Once Upon a Zombie dolls when I laid eyes on them. I received the Little Mermaid to do this review and I really love how she is designed. The first thing that you notice when you look at this doll is her amazing eyes. They are so detailed and beautiful! Being the goth girl that I am I really love her and the whole line and want them all! They are doing a whole line of new dolls coming out in the future right now they are in prototype as we speak. 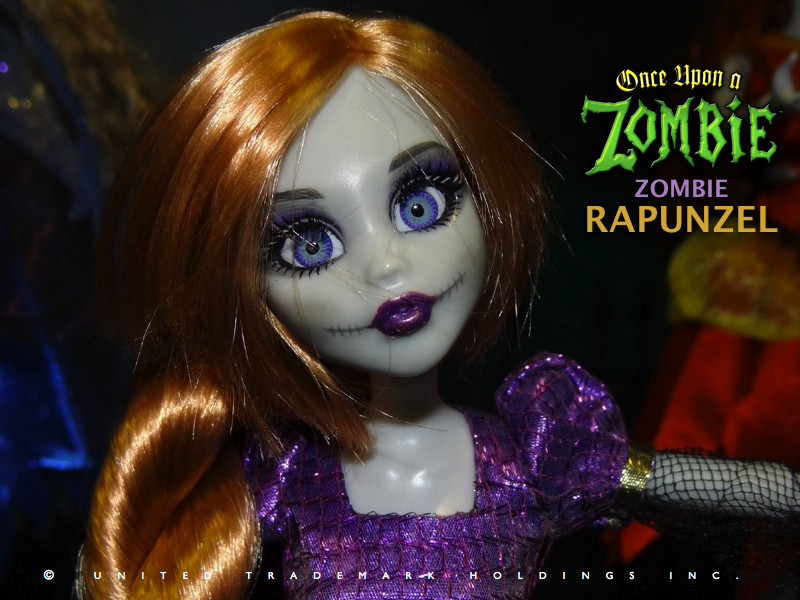 You can check out the Once upon a Zombie site and see details about how the princesses became zombies and webisodes coming soon. Here is a close up where you can see her amazing eyes. This is from the companies site. I posed her with some bone and skull vase fillers I had laying around the house I picked up around halloween. The plan is to use them at my wedding whenever that happens. I tried to make it look like she was chewing on the bone but it was hard to balance it on her hand.. This is a close up of some of the stitch work that she has throughout her body. Her skin is an off white color which is something you would expect from a zombie without being the gross walking dead zombie. Her hair is gorgeous and soft and shiney. It is slightly messy but resembles what your hair would like like if you were submerged in water. Also she is a zombie so its not meant to be perfect. I don't know why but she makes me think of Sally. Once Upon a Zombie is most definitely an interesting take on Disney Princesses. My favorite princess is normally Ariel, but when I went to the site I was surprised to like Belle the best. Must be the red hair. Lol. I think these are awesome. Are they designed like the monster high dolls where they come apart? If so my only concern would be for little toddlers as the moster high dolls come part very easy and it gets worse the more people play with them which is why they sell replacement parts/alternate parts. The little ball and socket parts get worn out. That is my question, if they dont come apart then sounds like a great collection for older kids and adults. 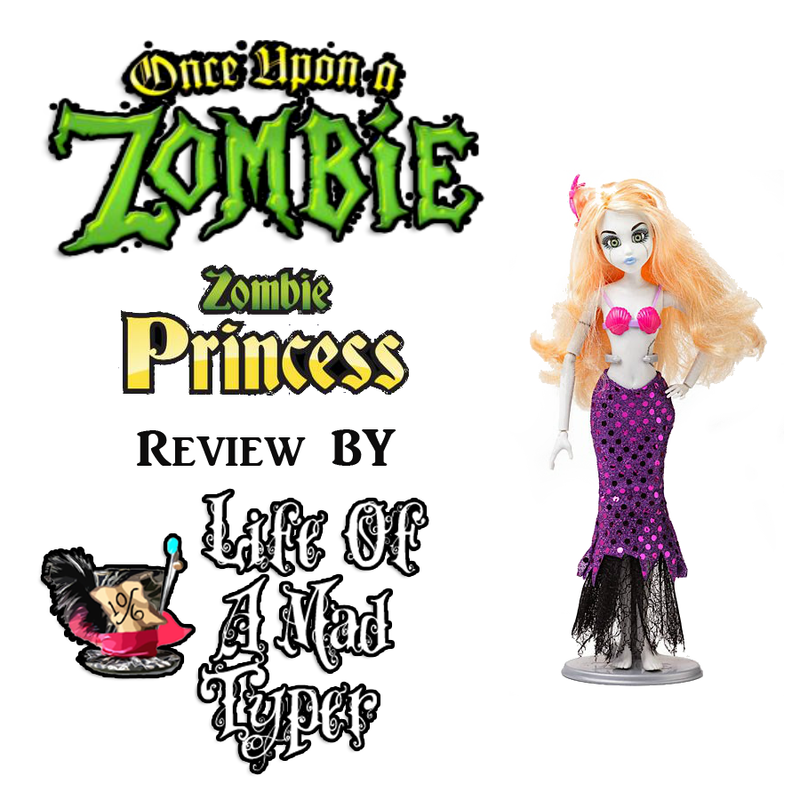 I love zombies and these are a very cute take on zombies and princesses! so cute! love them! haha my little girl is all about zombies right now. I am going to have to show these to here. Thanks for sharing! I think my favorite would be the Rapunzel, although I do love the princesses. How cute is the mermaid, I love zombies and all the detail work is AMAZING! This is awesome, great review. I love zombie dolls. ooohhh these are like little sallys!!! I am in love!! OMGoodness I love all your photos of this doll! Awww, this doll is really cute for a zombie. Her facial expression is great. Love the colors too. Very cute. Thanks for sharing.